Over on the right, under Resources, there is a link to a "Document Store". That's where I keep various bits of code and other texts. The TempLS material is there, for example. I had been keeping it on a location on drop.IO. Steve Mosher warned me that drop.IO has been taken over by Facebook, and will be closing. I looked around, and discovered that there is a much better alternative. Google Sites allows users, free, to set up a site with 100 Mb of space, to which you can upload files, images, etc. It also offers a range of templates replete with gadgets. So I have set one up. It's a bit of a work in progress. The templates are impressive, but none quite matched. I chose a project template, which has lots of facilities, but some not really appropriate management talk. I've tried to keep that to a minimum. So if you go to the new Document store you'll see a home page, with some intro stuff (not much yet), and a pointer to a page of "Project Documents". This is the new repository. The Google facility allows me much more freedom in writing descriptive text (so I'll have to do it :(). I'll also use it to host images - I've set up a "Picture Gallery". There's no real reason to look at that, as it's just for images to link in to posts, but you can if you want. I had been using TinyPic, but I don't need to do that any more. I'll also transfer to it ongoing items like the category index of posts, and the temperature tracking page. I'll also make an updated TempLS page and keep it there. The links within past posts still point to drop.IO, and I probably won't fix many of them. But you can always use the link under resources. One merit of the new scheme is that I can link to individual files. A note to thank Science of Doom. I am very honoured that he has chosen this blog as his successor, with the privilege of passing on the Woody Guthrie Award. I was especially pleased because SoD's style of dispassionate informative blogging is what I have aspired to here. So thanks, Science of Doom. And thanks to readers, who keep this blog going. Enough is Enough, and she nominated Greenfyre's. This was an interesting change, from a succession of rather philosophical blogs to one with a science/climate focus. Skeptical Science. They awarded it to Science of Doom and, well, here we are. Unfortunately, I can't find a reference to the event on Ã†rchie's Archive, so I can't go back further. But the search took me to a lot of interesting blogs, of which Archie's is one. It's discursive, but with a focus on Perth landscapes and history. I like Perth a lot - I've lived there - and I think Archie gets it well. Currently active and recommended. which may have been more relevant in its earlier life cycle. Anyway, it's now my job to pass it on. No need to rush there but thoughts would be welcome. Given its history, it seems ideas need not be restricted to the climate science community. I would have given a lot of thought to this excellent blog, but sadly, the owner retired a few months ago. I miss it. In the previous post I analysed the effect of expansion in a cylinder on condensation. As the pressure reduces, of course, the volume increases. The key question was whether it increases more or less than if the air had been unsaturated. This is supposed to help with what might happen in atmospheric uplift, as in a hurricane. The pressure reduces and the gas expands in the same way. If you focus on the moving air, in fluid mechanics that is the Lagrangian view. It's better for intuition - the boundaries of the volume travel with the fluid, and by assumption in the atmosphere, heat and other species like water vapor travel with it too, and remain in the boundaries.. That is because diffusion over the large distances is relatively small, although thermal radiation could be an issue. But there are problems when you want to think about the processes in relation to other things that are not moving with that fluid. Fixed boundaries are one issue - not so common in the atmosphere. But in the ongoing argument about Anastassia Makarieva's contraction theories (TaV1, JC and TaV2, Lucia1, Lucia2), AM prefers the Eulerian frame, a fixed volume in space. The good thing there is that you can assume steady conditions. At every point the velocity, temperature etc will remain steady, even though as you follow it in the flow, it changes. The bad thing is that the boundaries are no longer material boundaries, and you have to account for whatever is crossing it. Not so intuitive. Scientists tend to talk Lagrangian to students, but Eulerian to their computers. Here I'll take the Eulerian view of expansion and condensation. In accounting for boundaries, it helps to have only two (upper and lower). I'll look at a 1 m thick slice, assuming zero horizontal gradients. The notation is generally as in the previous post. We'll say z goes from 0 to 1, and I'll suffix accordingly (but if suffix is missing, assume zero). So T,V,P, Ï are assumed known at z=0. The incoming air is saturated. In the previous post, n, nw were moles in a volume V. Here I'll take V=1, so they are molar densities. The number of moles is conserved; in the notation of the previous post, Nd varies inversely as V, ie DNd/DP=-DV/DP. Velocity v increases with z. The results are much as expected. dT/dz is the lapse rate. 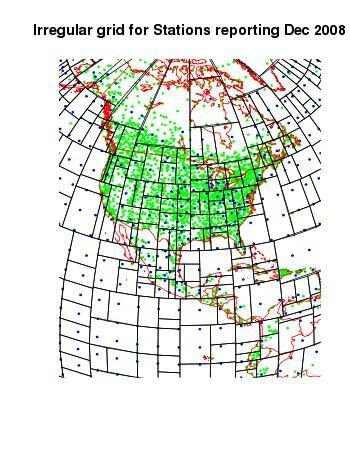 dnw/dz is numerically (withv=1) the precipitation rate in moles/km/m2/sec . 0.147 is equivalent to 9.5 mm/hr from a 1 km column - but remember the 1m/s velocity is arbitrary. The density reduces with height, but more rapidly for the saturated flow. And the velocity also increases more rapidly. It is a steady flow. But also expanding. The upward velocity would have increased just because of the hydrostatic density gradient, but it increases more because of the condensation. This is due to the release of latent heat, which dominates the contraction due to mass loss. The same expansion is seen in the density gradient (reducing faster). and the warming is seen in the well-known reduction of lapse rate with condensation. I mentioned in the previous post that the formula for DT/DP could be found, with slight modification, in the Phys Met notes of Dr Caballero. 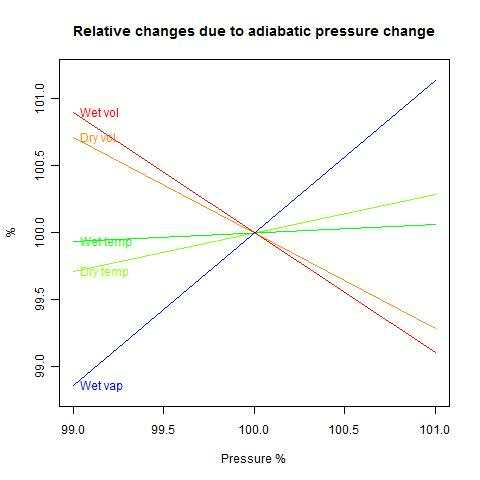 I realised then that it is just the formula for the saturated adiabatic lapse rate, which has a much longer history. As explained in that earlier post, my form isn't quite the same. There is a discrepancy due to the mole concentration I made in the Ideal Gas Law. I've kept with it, because it does seem to be the irght thing to do. There has been much blog discussion of whether condensation of water in the atmosphere is accompanied by a volume expansion or contraction. Standard theory says expansion, but Anastassia Makarieva has been promoting a theory that winds are driven by contraction caused by condensation. There is discussion here and here. The paper (M10) is available and open for online discussion here. M10 has a whole section devoted to demonstrating that a fixed adiabatic volume cannot undergo condensation. As I'll show, this is an unsurprising result. But the section arises from reviews of an earlier paper suggesting hurricanes were driven by condensation-induced contraction. Reviewers objected that latent heat release would outweigh the tendency to contract to to loss of water vapor volume. So there was no contraction to provide energy. On the Air Vent threads, various experiments to study condensation/contraction were proposed involving air in bags and bottles, etc. I have been trying to explain how they lack the adiabatic expansion that causes cloud condensation. Bodies of air rise, and as they do so they expand, doing work and cooling. If they are saturated with water vapor, some of this condenses. Because the cooling is adiabatic, the latent heat is retained and slows down the cooling and condensation process. The result is that the air parcel becomes warmer than its surroundings (though cooler than it was originally) and so expands relative to nearby air. Below the jump, I'll describe a stationary volume-change process with condensation, and calculate the expansion effect. Consider a volume of saturated air held adiabatically in a chamber with a piston which can force an expansion. For definiteness, let's say that V=25 m3 at T=300°K, containing n=1000 moles of air+water at P=100 kPa. Latent heat (of vap) L=45 kJ/mol. There are nw =36 moles of water vapor present. There are three equations in the four variables (DT, Dnw, DP, DV). However, one of these, DP or DV, is specified (the amount the piston is moved). If you set DV=0, then there is just one solution DT= Dnw=DP=0. In other words, no condensation - nothing can happen. That's what Sec 2 of M10 was about. Fixing DP is most natural for atmospheric comparison, since P is a measure of altitude. Dividing the equations by DP gives the derivatives ( DT/DP, Dnw/DP, DV/DP). Remember these are proportional derivatives. If you change P by p%, then you change V by (DV/DP)*p %. I did a first solution with nw=0. This is in effect the dry air case. The R code is below. Added: Plot of % variation (dry and wet) of temp, volume and wv with varying P. Note that with expansion, P diminishes. First observation - wet DT/DP is much smaller. Condensation is stabilizing the temperature, as you'd expect. And a 1% drop in P causes 0.916 1.14% of water vapor to precipitate. But the answer I was looking for is the third. A 1% drop in P increases the volume by 0.861 0.896% - more than it does for dry air (0.714%). The condensation causes the volume to expand relative to non-condensing air. This study was just of air in a confined space. But it can be applied to saturated air rising in parcels in the atmosphere. The dry lapse rate is the temperature gradient which is neutral for air moving without condensation (more here). So the moist air is cooling more slowly than the lapse rate as it rises, and is expanding relative to air on its level. Equations 4-6 can be rewritten in even fewer non-dimensional parameters. I'll take the ratio cv/R = 5/2. You can use this result to get any desired derivative, eg DV/DP = a4/a3. Remember again that D is proportional, so dV/dP = (V/P) a4/a3. Update. I see that Eq 3.74 of Rodrigo Caballero's PhysMet lecture notes gives a version of DT/DP which is equivalent to (1+c)/(3.5+bc). He says this is an approximation (3.72). I think that is equivalent to omitting the last term in my Eq 2, which would indeed give this expression. However, I believe the inclusion of that term is more accurate. Beta version of GHCN v3 is out. I've only recently read CCE's comment - I've downloaded v3 from here. It's late where I am, so this is very much a first impression. The README file is helpful. The inventory file has a new layout, so TempLS will need some changes to read it. It seems to have basically the same data, though, about the same 7280 stations as v2. The data file also seems to have much the same actual data. But interspersed are a number of codes. There is a measurement code and a quality code, but not yet used, except for USHCN. Then there is a source code (saying where the data comes from). So there's work to do to get TempLS to read it. It's not clear that this beta version has data changes that will affect the results. But we'll see. There's also a more thorough examination of v3 from Zeke, referenced in his comment. He has also done the v2/v3 comparison, as well as a station count (V3 has more readings, but no new stations), and a look at adjustments. Mosh says there that the main diff with the dataset is that they have eliminated many (all?) duplicates. Indeed, there are 443933 lines in the file, vs 597182 in v2.mean. GISS is rather early this month - seems to be even before MSU-RSS. It's the one index that had been falling rather rapidly, so no change is a change. The monthly land/ocean global plots below are from Moyhu's monitoring page. Note the change of base, to put all indices on an equal footing. Minor - cells are unevenly populated with stations. 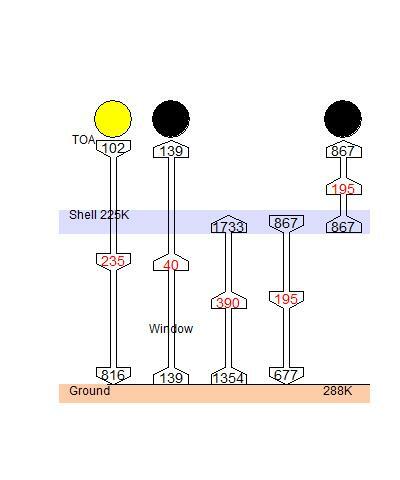 These can be avoided with the use of irregular grid cells, which can be smaller when stations are dense, and can be formed with a requirement that they always have at least one data point. There are needs here which make well-known unstructured meshes like Voronoi unsuitable. This post describes one based on binary trees. The naive way to get a world average temperature anomaly is just to add results for all the stations. 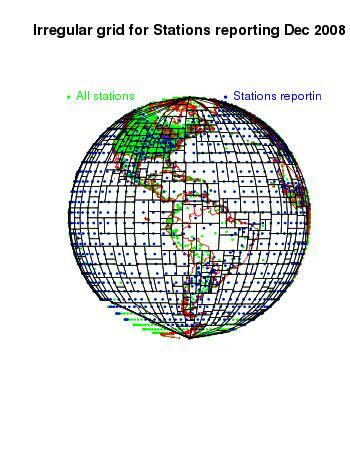 But it gives wrong results when stations are concentrated in certain regions. And it underrates SST. The usual way is to create a regular grid, and in some way average the readings in each cell. Then an area-weighted mean of those cell averages is the result. This gives a fairly balanced result, and has the same effect as numerical surface integration, with each grid a surface element, and the integrand represented by the cell average. TempLS does something which sounds different, but is equivalent. It forms a weighting based on inverse cell density, expressed in each cell as cell area divided by the number of data points in the cell. Another way of seeing that is to imagine that the cell was divided into equal areas, one containing each cell. Then the weights would be just those areas. Empty cells are usually just omitted. But if the temperature anomaly averaged over just the cells with data is presented as the global average, necessarily some assumption is implied as to their values. If you assumed that each missing cell had a value equal to the average of the cells with data, then including them would give the same answer. So this can be taken to be the missing assumption. Is it a good one? Not very. Imagine you were averaging real temperature and had a lot of arctic cells empty. Imputing world average temperatures to them is clearly not good. With anomalies the effect is more subtle, but can be real. The arctic has been warming more rapidly than elsewhere, so missing cells will reduce the rate of apparent warming. This is said to be a difference between Hadcrut, which just leaves out the cells, and GISS, which attempts some extrapolation, and gets a higher global trend. GISS is sometimes criticised for that, but it's the right thing to do. An extrapolated neighbor value is a better estimate than the global average, which is the alternative. Whatever you do involves some estimate. Seen as a surface integral approx, there is no need for the cells to be regular in any way. Any subdivision scheme that ascribed an area to each data point, with the areas adding to the total surface, would do. The areas should be close to the data points, but needn't even strictly contain them. Schemes like Voronoi tesselation are used for solving differential equations. They have good geometric properties for that. But here there is a particular issue. 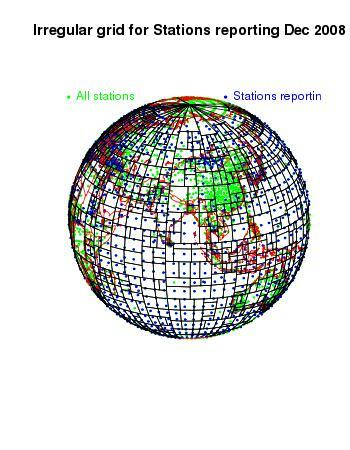 There are many months of data, and stations drop in and out of reporting. It's laborious to produce a new mesh for each month, and Voronoi-type tesselations can't be easily adjusted. I've developed schemes based on rectangle splitting, which lead to a binary tree. 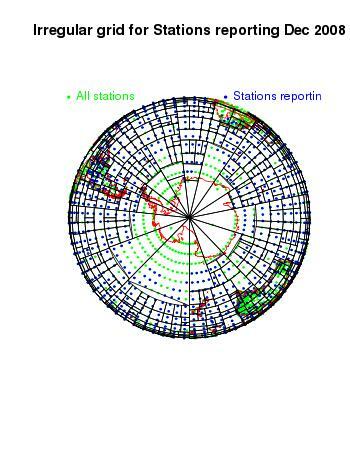 The 360x180 lon/lat rectangle is divided along the mean longitude of stations. Then the rectangle with longest side is divided again, along the lat or lon which is the mean for stations in that rectangle. And so on, but declining to divide when too few stations would remain in one of the fragments. "Too few" means 2 at the moment, but could be refined according to the length of observations of the stations. There's also a minimum area limit. That's done at the start. But as we go through month by month, some of those rectangles are going to have no data. That's where the binary tree that was formed by the subdivision comes in. It is the record of the divisions, and they can be undone. The empty cell is combined with the neighbor from which it was most recently split. And, if necessary, up the tree, until an expanded cell with data is found. In binary tree terminology, the final set of rectangles after division are the leaves, and adding a notional requirement that for each month each cell must contain data leads to some pruning of the tree to create a new set of leaves, each being a rectangle with at least one data point. Then the inverse density estimate is formed as before - the cell area divided by the number of data. Those are the weights for that month for each cell. Yes. I've produced a version of TempLS V2 with this kind of meshing. A picture of the adapted mesh for Dec 2008, GHCN, is above. I'll show more. The mesh manipulations, month to month, take time. I've been able to reduce the run time for a Land/Sea GHCN run to well under a minute, but the irregular mesh doubles that. I'm hoping to improve by reducing the number of tree pruning ops needed. I did a run from 1979 to 2008. Here are the trends using standard TempLS and the irregular grid version. At this stage, I just want to see that the results are sensible. Not much yet. The last plot just shows that the irregular mesh gives similar results - nothing yet to show they are better. I may do a comparison with GISS etc, but don't expect to see a clear advantage. Where I do expect to see an advantage is with an exercise like the just 60 stations. I think in retrospect that that study was hampered by empty cells. In fact, almost every station had a cell to itself, which meant they were all equally weighted, even though they were not evenly distributed. Work is needed to adapt the method to region calculations. If the region can be snugly contained in a rectangle, that's fine. But the surrounding space will, by default, be included, which will overweight some elements. One virtue of the method is that it has something of the effect of a land mask. With a regular grid, coastal cells often contain several land stations and a lot of sea, and in effect, the sea has the land temperature attributed to it. The irregular grid will confine those coastal stations in much smaller cells. The mesh enlargement in the Antarctic seems to overshoot somewhat - it makes large elements with quite a lot of nodes. This should be improveable. 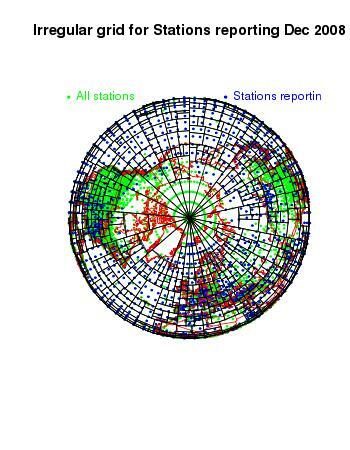 There are some big elements in N Canada - this was the period when few stations there were reporting. For Version 1 of TempLS I posted a PDF guide, TempLS.pdf, to the mathematical basis. It's a useful starting point here. But this time I'm going to try to do it in HTML below. Colors help. Ver 2 - Regional spatial variation. I need to use a summation convention. I'm referring to various matrices etc as just indexed sets, and when they are multiplied together, every index that appears twice is understood to be summed over the range of that index. It's called a dummy index, because it doesn't matter what symbol you use (as long as it's not used for something else). Once the summation is done, that index doesn't connect with anything else. I'll be talking about weighted least squares, and an exception is needed for the weight function. It's indices are sometimes put in brackets, which means they should not be counted in this pairing. The index still varies with any summation that is going on. The reason for this is that summation signs are difficult in HTML. But also it gets easier with colors. I'll color indices subject to summation blue, standalone indices red, and exception indices lime green. 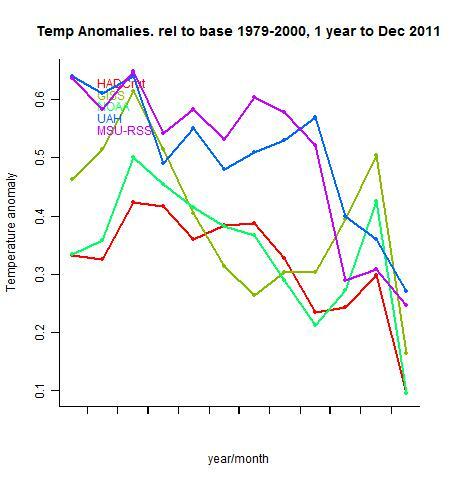 We have, on the GHCN and similar sets, a number of stations (s), with temperature readings (x) by year (y) and month (m). m varies 1:12. The model is that x can be represented by a local temperature L, with a value for each station and month (seasonal average), and a global temperature G depending on year alone. The L and G are parameters to be fitted. We minimise a weighted squares expression for the residuals. The weight function w has two important roles. It needs to ensure that stations make "fair" contributions to the sum, so that regions with many stations aren't over-represented. This means that the sum with weights should be like a numerical integral over the surface. w should be inversely proportional to station density. combining s and m as one index, and where T signifies transpose. Examining the various terms, one sees that A and C are diagonal matrices, so the overall system is symmetric. This is not a large system to solve - G has of order 100 components (years). But the multiplications to create it are time-consuming. The alternative offered by TempLS is to use the conjugate gradient method on the whole system. This turns out to be fast and reliable. There is a rank deficiency in that a constant could be added to L and subtracted from G. This is resolved by forcing the first component of G to be zero. Later this can be adjusted to set the base period for G as an anomaly. The same issue arises with spatial models below. That is what was done in Ver 1. In version 2, it is called model 1.The weight function w was estimated using a grid to get the station density locally. But we could try to put more parameters into G. In particular, we could try to let it vary spatially, and this is what is new in V2. We need a set of orthogonal functions, expressed as a matrix Psk, being a value at each station, where k indexes the functions. Actually, the functions needn't be strictly orthogonal, but should express the range of possible spatial variation. The continuous function that this produces is Pk(lat,lon)Hk, where H is a set of coefficients to be found. J=1, yr0≤y≤yr1 gives an average C between those years. In Ver 2.0, this is model 3, and is restricted to a single year. Solving is by the same elimination method - the multiplier of L in the first equation is again a diagonal matrix. The conjugate gradient method is less attractive here. 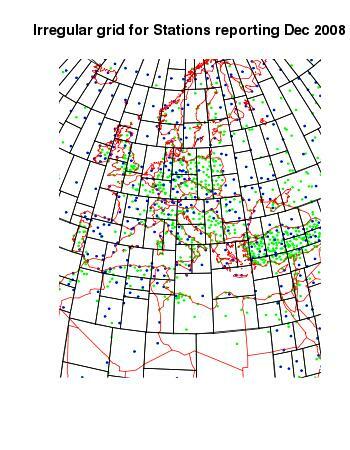 Spatial methods can be used over the whole globe or over sub-regions. There is a tension between the resolution you would like to get by using many orthogonal functions, and the information available. If there are too few stations for the resolution, the final matrix will be ill-conditioned, and spurious results will occur. TempLS deals with this by doing a diagonalization of that final symmetric matrix, and inverts a subsystem based on the larger eigenvalues - a kind of PCA. The user can specify where the cutoff occurs, using a variable eigcut. This should be a small number, between 0 and 1, but closer to 0. I often use 0.01 - higher values are more conservative. A strategy is to try different values until the results do not depend on your choice. The number num_orthogs in the user file gives the approximate resolution (in half-periods)in one dimension. The total number of functions generated is approximately the square of this. Values in the range 8-12 are common - maybe up to 16 on the globe. Remember that it will generally be over-ridden by the eigcut facility - ie if you set num_orthogs too high, you'll just do some extra work for the same result, while if you set it low, you won't get the resolution that you could. A frivolous topic, to be sure, but it will probably be discussed in coming months. Will 2010 set any kind of hottest year record? It doesn't look particularly likely, but I'm sure people will speculate. So I've produced a tracking plot. 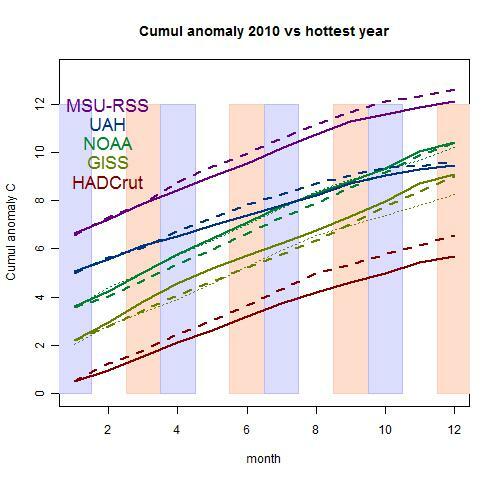 It shows the cumulative sum of anomalies for each index, for 2010, and the hottest year of each index to date. For all but GISS that's 1998; for GISS it is 2005. Update - thanks to a commenter who noted that for NOAA also, 2005 was the hottest year. 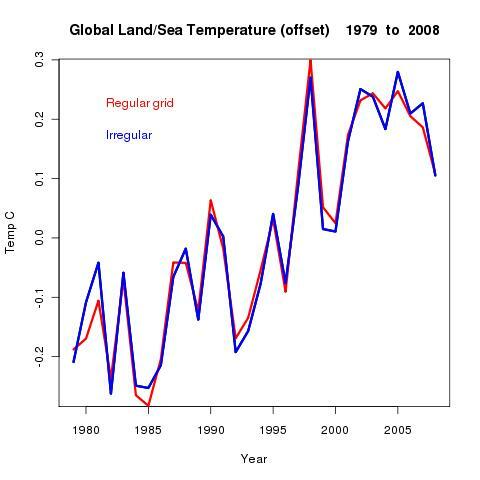 The plot is amended, with 1998 lightly dotted for GISS and NOAA. The hottest year is shown as a dashed line. If 2010 is ahead by the end, it will be the new hottest year. Most indices lag 1998 now, but 1998 cooled at the end. GISS is ahead of its target, but 2005 didn't cool. 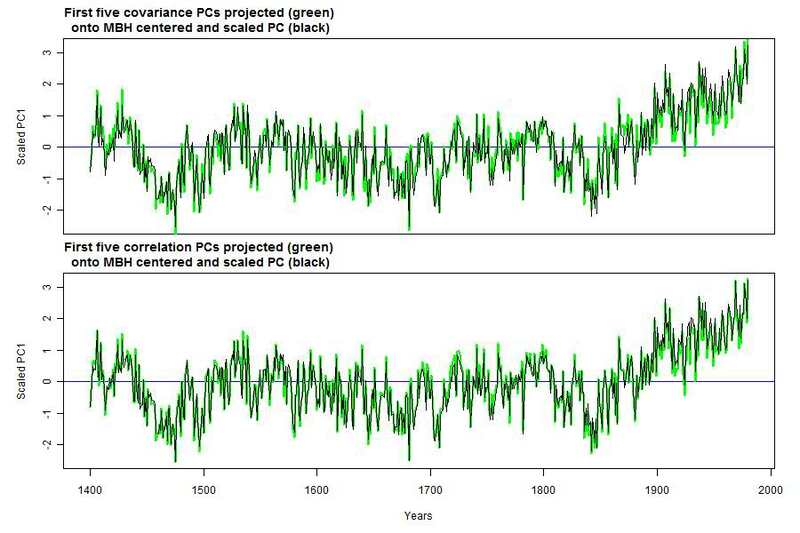 Each index is offset by 1.5°C from the next, for visibility. I'll update this plot regularly at the ongoing temperature site. Update - Lucia also has a new post on record prospects. Willis Eschenbach at WUWT once again found something that he couldn't believe. 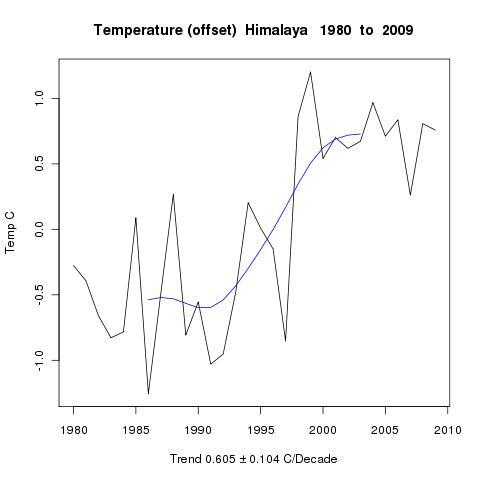 The Himalayas are warming rapidly. 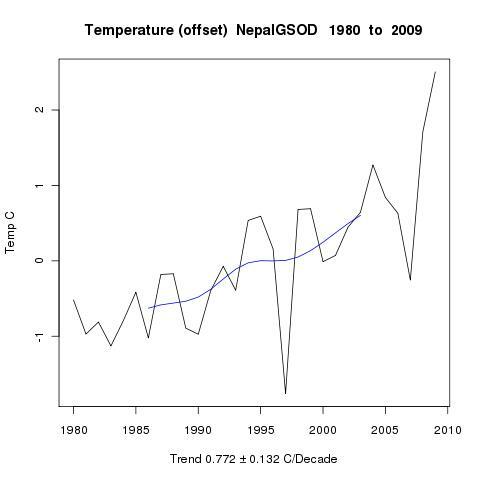 There's an IPCC claim that warming in lower areas of Nepal may be about 0.4 C/dec, and in higher areas 0.9 C/decade. Willis' post got sidetracked into fussing about GISS adjustments to 20 years of data at Katmandu. But a comment on the thread was right to the point. The IPCC was relying on a paper by Shrestha et al which had looked through records of 49 stations in Nepal in finding that result. Zeke Hausfather at the Blackboard looked at GSOD data. This is a more plentiful data set derived from SYNOP forms. It is unadjusted, but does not go as far back in time. He found there was also a strong warming trend. His analysis was based mainly on Katmandu. He also pointed out that the IPCC did not use GISS adjusted data. So I thought I could use TempLS and the GSOD database to look at Nepal and even beyond in the Himalaya. 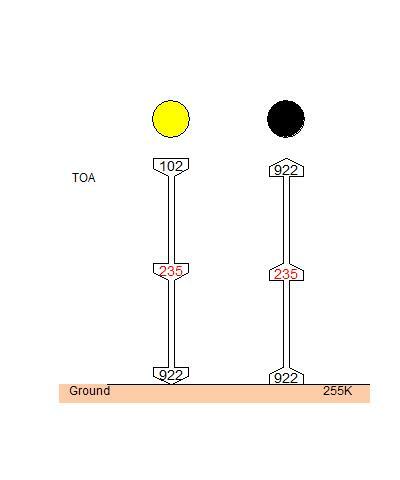 TempLS also allows us to look at different altitude ranges, subject to station availability. 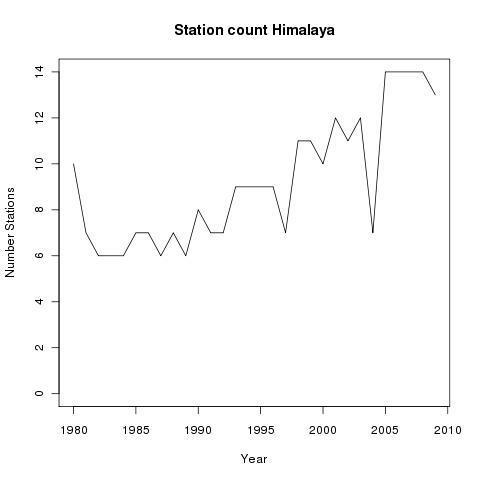 Willis found only one GHCN station in Nepal - GSOD has 12, but some with short histories. Anyway, here's the analysis. Most of the trends are since 1979; data histories get sparse before then. Update: Zeke pointed out a bug. My first diagnosis (below) was wrong. The problem was not in the analysis program but in the GSOD datafile, as modified by my preprocessor. The GSOD database is not as tidy as GHCN, and some data refer to stations not in the inventory. 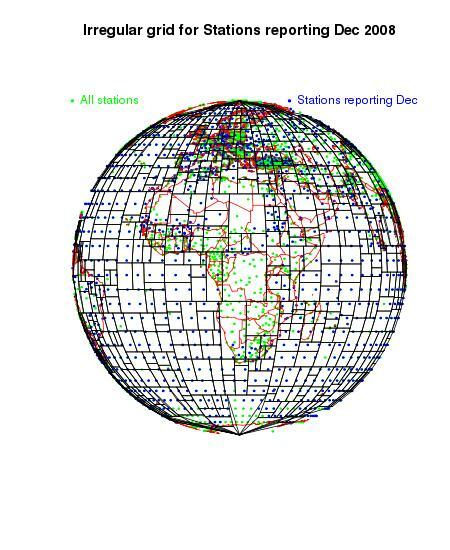 In the process of fixing that, a block of stations (including Nepal) got displaced by 1. This doesn't affect the analysis, but does affect the selection - you don't get the right stations. For countries, the effect is small because they are consecutive, so only one station is wrongly chosen. But for an altitude spec, it's more serious. The Nepal trends are little changed, and Himalaya increase a bit. The two Hi sets just have too many gaps for an analysis to work, so I've dropped them. Earlier update. Zeke, in the comments has pointed out a bug. It seems to be in the new multi-run capability of ver 2, and to affect small datasets where sometimes no information at all exists in a particular month. So the HiNepal results are invalid, and I'm checking HiHimal. I believe the Nepal and Himalaya results are unaffected. First, an overview of the region in Google Earth, using the KMZ files described here. The rural stations are green, urban yellow, small towns brown, and the big pushpins have 50 years data recorded (very small <20 years). The sparsest section is actually India. 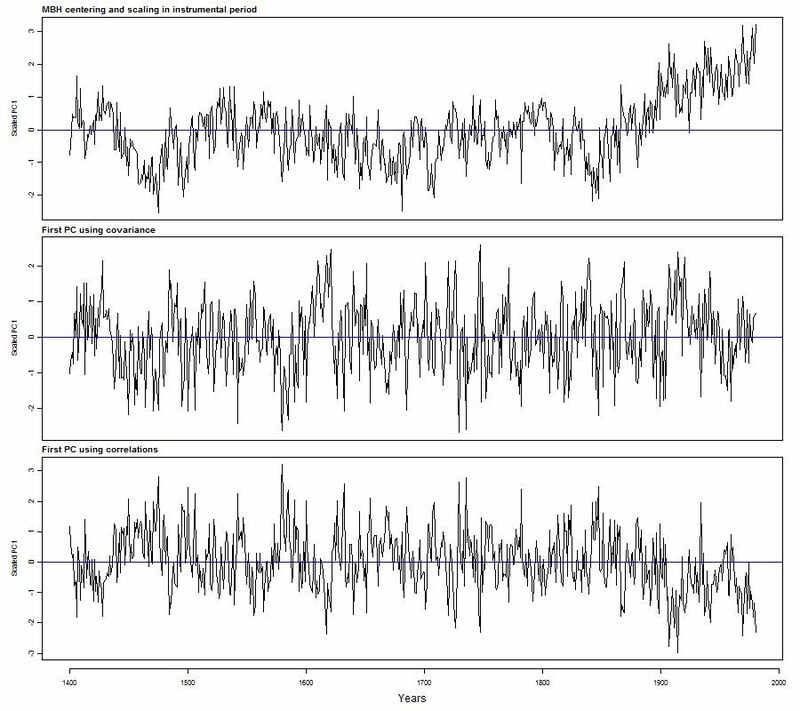 Being able to analyse various selected subsets means that we get a feel for how regional variations might affect the conclusion that the area is warming. All these subsets show it to a marked degree. No sub-region has a rate less than 0.5 C/decade (5 deg/century). Update. 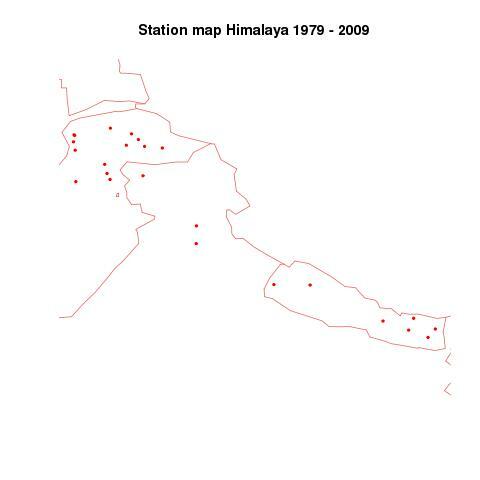 Here is a list of the stations in the Himalaya set with some metadata.